Based on reviews from 139 users. Learn how our rankings work or see our guide to Asics football boots. Updated Apr 2019. From its very humble beginnings, Asics has risen to be among today’s biggest multinational corporations that produce footwear and sports equipment. Their products, which are mostly in the premium range, carry the company’s high standards in terms of design and quality. That said, one can expect no less from their line of Asics football boots, which are packed with the brand’s modern innovations meant to them stand out on the pitch. Asics has been a major player on the sneaker market since the late 1940s. However, the brand that we have all come to love and obsess over at one time or another wasn’t always known as Asics. Here’s a quick travel through time to rediscover the rich history of the Tiger. The early beginnings of Asics date back to post-war Japan in the late 1940s, when Kihachiro Onitsuka founded the company. Onitsuka envisioned his brand to create products aimed at promoting “a sound mind and a sound body,” which in Latin was translated as “Anima Sana in Corpore Sano.” These words would later inspire the future name of the company, which is basically its acronym. However, in the first years of its operation, Asics was known as Onitsuka Tiger, after the name of its creator. The brand initially embarked on creating basketball shoes, which were considered the most difficult shoes to manufacture. They believed that if they are able to overcome this challenge, they could do so with other shoes, as well. The first ever shoe model from the brand was released in the Spring of 1950. It featured a tiger’s face inscribed on the arch of the shoe. The design would later become the signature Onitsuka Tiger trademark. One revolutionary concept came when Onitsuka was inspired by the suckers on octopus tentacles. This lead him to create a shoe that featured deep “dimples” on the soles, similar to that of an octopus. This detail was meant to make the shoe perform with better grip. This unique creation was among the company’s first breakthroughs in the industry. From the 1950s and into the 1960s, the company manufactured numerous shoes for various sporting activities. These included marathons, dancing, skiing, volleyball, mountain climbing, golfing, gymnastics, wrestling, tennis, and football. During these 1960s, the company also underwent a rebranding as Onitsuka Tiger and added the Tiger stripes on the sides of the shoes to make them more identifiable. The first pair of football boots from the brand was released in April 1962. It was made of cloth, and it wore three studs on the heel and four on the ball of the shoe. Each stud had a larger contact area with the ground, in comparison to today’s current models. Two years after, leather football boots were also released on a trial basis. In 1977, Asics was birthed out of a collaboration with two other companies. It carried the original philosophy of Onitsuka, which is that of promoting a healthy mind and body through sports and fitness. This premise serves as the foundation of every sneaker that the brand releases. The new image of the brand, with the Asics logo, proved to be a big hit among sportsmen and women. An increasing number of athletes were seen wearing and winning in the sneakers, spurring the brand to grow in popularity. Asics established the reputation of being a high-performance sporting sneaker. From the 1980s to the 2000s, Asics has been identified with the cutting edge technology based on shock absorbing foam insoles and gel pad cushioning for high performance, low impact running. The brand is most acclaimed for its Gel Lyte cushioning technology that has remained a mainstay in every Asics. In 1987, the Gel cushioning system made its debut. This innovation is probably what Asics is most applauded contribution to the football market. Since its launch, it has remained a mainstay feature of Asics sneakers. Aside from being aesthetically pleasing, this feature is made for high-performance activities. With the success of the gel cushioning also came the introduction of various technologies from the brand. The line of Asics football boots and shoes for other sports also evolved, resulting in increasing popularity of their products. Today, Asics is considered as a contemporary street and athletics sneaker brand that holds a rich heritage in design and performance. Asics has always been keen and intentional in the design of their Asics football boots. With each new model, their team defines the design based on five principles in order to come up with a shoe that is perfected for its purpose. Being a sport that relies heavily on footwork, playing football can be quite strenuous on the foot. Cushioning functions to minimize that strain by absorbing the impact whenever the foot strikes the surface. This detail is usually employed on the heel as well as the forefoot. Some designs even have cushioning systems that run all the way through a shoe’s midsole. Moreover, the level of cushioning is unique to each wearer. It can depend on his weight, speed, and type of training. Support refers to the degree of stability offered by an Asics football boot. The quality of stability can normally be evaluated when at play. With adequate support, wearers can be certain that their feet will be prevented from excessively curling inwards or outwards. This element also assists in securing the foot throughout the game, especially when players perform cuts, turns, and twists on the pitch. When talking about ride, it basically means the degree to which the feet feels the ground when running through the pitch. Football players usually prefer that close feeling since it allows them to be enhanced responsiveness on the pitch. Meanwhile, there are also those who prefer something that is more comfortable and opt for Asics football boots that use soft, bouncy materials on its sole. How an Asics football boot fits around the foot is critical to a player’s overall performance. Football boots that offer a snug fit usually offer better stability as it secures the midfoot in place. Then again, wider boots allow more room for the feet to move freely and unrestrained. They also accommodate wearers with broader feet. Every Asics football boot needs a reliable grip for the surface it will be used on. Grip determines whether a shoe can work efficiently in a particular type of surface. The level of grip demonstrated by a football boot dictates how well it can facilitate players as they execute different moves on the pitch. Asics is a brand that carries a remarkable reputation for creating premium quality products. Having entered the football world in the late 1960s, the brand has proven their worth in this business, creating football boots that make a statement. The name of this Asics football boot says it all. Among the brand’s most current releases, the Asics Menace is a high-performance football boot engineered to be a threat to any opponent. It wears a lightweight and responsive design that highlights 3mm shorter studs when compared to the Testimonial 4 IT. This football boot is perfected for hard summer grounds. Moreover, its stud configuration enables wearers to get a quicker release and carry the pace for the game. Founded on countless years of research and analysis alongside a lineup of innovative technologies developed for boot manufacturing, the Asics Lethal Testimonial 4 IT is one reliable companion on the pitch. Among this boot’s features include a Solyte midsole that enhances cushioning and a kangaroo leather upper that gives enhanced foot feedback. It also utilizes the HG10mm technology that is a staple detail in all Asics football boots, meant to minimize the risk for foot injuries. Set in a brilliant and iconic look, the Asics Lethal Flash IT stands out on the playground. Sporting a calf leather vamp, this football boot provides its wearers a premium feel that is usually not expected for a shoe in this price range. It also showcases additional features meant to provide comfort and stability. These include the HG10mm heel and the boot’s removable molded sock liner that both add to its overall value. Among the brand’s high-end offerings, this well-priced Asics Lethal Tackle offers good all-around performance. One thing that sets this football boot apart is its 6:2 stud configuration that allows for a superior grip alongside an evenly-spread load across the forefoot. Its added features include the Solyte Midsole and outsole that offers shock-absorbing benefits. Moreover, a three-density outsole ensures that this football boot has the durability to last for many years. Regarded as the ultimate statement boot by boot enthusiasts, this Asics football boot is one incredibly lightweight shoe that is perfect for athletes who prefer a “zero platform” shoe. With its molded injection outsole, the DS Light X-Fly K performs with outstanding grip and releases, allowing wearers to efficiently execute directional changes during the game. Moreover, an added external heel counter gives added it and comfort, while its kangaroo leather upper facilitates excellent ball control. With the rising demand for current, innovative football boots, football boot manufacturers worked hard to keep up with the changing needs of these modern times. Brands are coming up with their own set of new technologies meant to improve the performance and aesthetics of their models. Conventionally, most spike shoes for football are not equipped with a midsole sponge. This puts a heavy load on the legs. The HG10mm technology has been developed to alleviate this load. This technology works to lessen the pressure on the leg as well as the impact on the knee when running forward. It makes use of a sole that is 10mm higher in the heel compared to the toe. It also adds a midsole foam into the heel part of the football boot. This structure optimizes leg movement during running forward and reduces the load on the leg. Meanwhile, the midsole on the heel minimizes the impact on the knee. This Asics football boot technology can be seen in the Asics Gel Lethal Tigreor 10 IT. This feature will greatly benefit players with issues in their Achilles tendon, since the raised heel reduces pressure over that area. As manufacturers aim to reduce the weight of their football boots, this most often leads to a decreased function of the material. The Solyte midsole is the answer that Asics has developed to meet this need. It is half the weight of EVA (ethylene vinyl acetate) foams, which lines the midsole of most football boots. It also provides 20% more shock absorption. This custom resin holds strong foaming properties that allow it to be more lightweight than typical sponges. An example of an Asics football boot that carries this feature is the Asics Lethal Testimonial 4 IT. This football boot has been engineered with a Solyte midsole for better cushioning. This sole resin material is about 30% lighter than the PU resins previously utilized in outsoles. The brand believes that reducing weight must not sacrifice resistance to wear. Hence, they made sure that this sole unit has moderate elasticity to resist regular wear and tear. This Asics football boot feature is utilized by the Asics Lethal Legacy IT. This type of outsole covers the entire surface of a football boot’s base. There are no cut outs that can be found around the midfoot. Whenever the foot is under exceptional torsion at the midfoot, this outsole will allow the shoe to respond with grip under the arch as it lowers. The enhanced grip and torsion stability provided by this sole unit become more noticeable when used on trickier terrain. Among the Asics football boots that feature this detail is the Asics GEL-Lethal Tigreor ST. Considered as a groundbreaking midsole from the brand, the FlyteFoam is remarkably 55% lighter than the industry standard. Aside from being super lightweight, this foam also benefits from organic “super fibers” that allow it to bounce back into their original shape with every stride. This results in perfect adaptive cushioning that is felt from the start of the game to the finish. Moreover, this midsole is relatively more durable than its predecessors. This innovation can be seen in the Asics Lethal Tigreor IT FF. AHAR basically stands for Asics High Abrasion Rubber, which is a tough rubber compound used in heavy contact. With this compound, outsoles become more durable and therefore, last longer, without having to sacrifice on certain functions, including grip. The idea of this technology was based on the concept of supporting the move of environmental load reduction by extending the life of products. Compared to the conventional rubber, AHAR as about two times higher abrasion resistance. An Asics football boot that shows off this technology is the Asics Menace. This Asics football boot technology functions to distribute impact and support throughout the base of football boots. This results in a more optimized effort as well as a more confident run on the pitch. 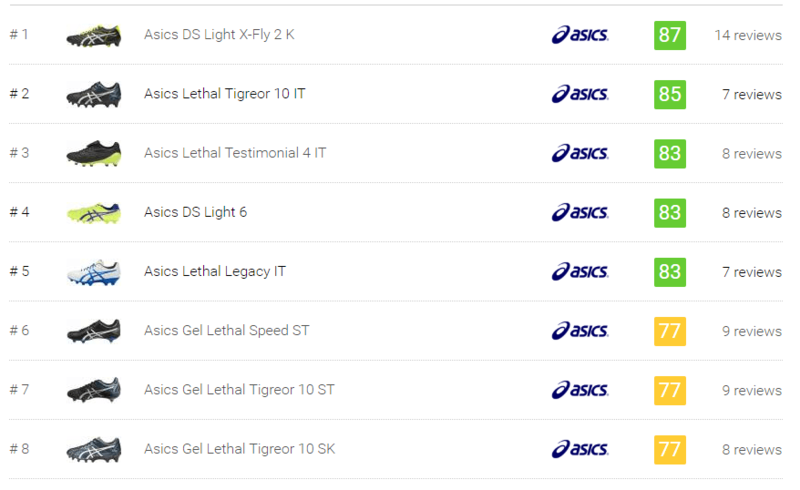 The Asics GEL Lethal Ultimate IGS 12 is known to have the Guidance Trusstic System feature. This Asics innovation has been developed to improve the stability of football boots. It works by preventing excessive shoe twisting, allowing for a more optimized movement on the pitch. It also promotes enhanced stability by reinforcing the middle area of the sole, preventing the shoe from twisting. The shape of the Trusstic is tailored to the type of shoe, depending on how it will be used. The Asics Gel Lethal 18 boasts of this Asics football boot feature. For decades, the GEL cushioning system has been the brand’s core technology for their footwear. It is placed within the boot’s midsole, particularly at key impact areas. This cushioning system works together with the midsole material in absorbing shock from vertical forces, in all kinds of sports. The rearfoot GEL cushioning system works to minimize vertical impact during heel strike. Meanwhile, the forefoot GEL cushioning system reduces the force when the foot moves in propulsion. What Asics football boots does the brand offer for indoor football games? In as much as Asics is a company that has built its reputation on the reliability of their cushioning systems, they do not have an indoor football boot line from their current selection of Asics football boots. They do, however, offer an “indoor court” line of shoes that are not specifically made for football. These silhouettes are designed for fast, unpredictable movements on hard, indoor surfaces. A minor quirk that some observers have noticed, though, was that most of these shoes had a raised toe box and a slightly thicker upper, which was quite different from the typical indoor football trainer. Then again, if you are familiar with the comfort and excellence of the brand’s gel technologies, you will be willing to give their indoor court line a try. Asics Gel Sensei 2 - This indoor court shoe utilizes the rearfoot and forefoot gel cushioning system that works to protect the foot and minimize the impact with every step. It also utilizes a Solyte midsole and a gum rubber outsole for grip on indoor surfaces. Asics Gel Blast 3 - Similar to the latter model, this shoe also employs the gel cushioning system both on the rearfoot and forefoot. Additional features include a combination upper that utilizes synthetic leather and mesh. It also wears an EVA sole. Does Asics offer limited editions of their Asics football boots? Asics does not release limited edition football boots as often as other brands do. They did, however, come up with a classy and bold limited-edition boot - the Asics Lethal Indigenous. The Asics Testimonial is among the brand’s long-standing football boots. It has been famed for its great performance on the pitch through its ultra-soft leather upper and sturdy outsole, alongside its classic style. For its limited-edition model, the brand has fitted this Asics football boot a subtle yet highly effective look. The Limited Edition Testimonial Indigenous sports a Black/Yellow/Red colorway. The color choices well complement its indigenous name, with the yellow and red hues being inspired by South American and African culture. Design-wise, this Asics football boot has been developed to be one of the most bio-mechanically sound boots available on the market. Its performance is facilitated by a soft kangaroo leather upper that offers supreme comfort and fit as well an excellent ball feel. The innovations used in this shoe exhibits the brand’s high level of craftsmanship. Meanwhile, the sole plate of this Asics football boot is uniquely configured for a variety of field-based sports. It also performs with much stability as its supports the metatarsals. One other thing to note is that this shoe is only available in a firm ground version. Aside from their men’s line of Asics football boots, what options does the brand offer for women? It is true that most Asics football boots are usually set in a men’s version. But the brand does offer an option that suits women players, as well. One particular Asics football boot model that has been popular among female athletes is the Asics DS Light 3. This Asics football boot wears a lightweight design and offers enhanced responsiveness on the pitch. This DS Light version also sports a PU (polyurethane) injection outsole with the traditional round stud configuration that provides excellent grip and release. Fitted with an upper that combines kangaroo leather and Japanese synthetic leather, this football boot promised a premium experience when it came down to ball touch. Aside from their lineup of Asics football boots for men and women, the brand also has their own set of football boots dedicated for rising football superstars. Built under the same standards as the flagships, these Asics football boots for kids bring their own unique style to allow young athletes to shine and take control of the pitch. Asics Gel Lethal Ultimate GS 12 - This Asics football boot for kids is one high-end model that offers an excellent combination of protection, flexibility, and support. This football boot features a Solyte midsole that allows the foot to be cushioned when at play. It also employs a rearfoot GEL that helps absorb shock. This junior model also sports the HG10mm technology on its heel area, reducing the risk of injury to the limbs. Asics DS Light 2 JR - For a kids model, this Asics football boot is one great lightweight shoe. It has been fitted with an EVA midsole that gives stability and support, which is a very important factor for growing feet. Its other features include the brand’s HG10mm heel, a removable sock liner, and a multi-studded outsole. Asics Lethal Tigreor IT GS - This Asics football boot is among the brands premium released designed for young athletes. It highlights a kangaroo leather upper and vamp for precision in touch and control. It also utilizes a dual density outsole for enhanced durability and the HG10mm heel technology for added foot protection.